The title screen updates to include your company name after playing the game once, giving a nice touch to an otherwise boring screen. Game Dev Tycoon has been out for a while, but it only came out on Steam on August 29th, meaning it now has full Steam integration. Achievements, steam in-game layout, means that the popular game for pirates has now become a official down to earth proper game. I’ve been looking forward to this version of the game for a while, and finally getting it on release day I spent the next 2 days playing 8 hours of the game. Game Dev Tycoon gives you control of a lone man who must make games for a living from his garage to start becoming a major part of the games industry. As you make more and more games, you can start renting out bigger buildings and more employees, which in turn makes bigger and better games for reviewers to give great reviews. It’s an endless cycle, one which’ll span 35 years of the industry, and will start with the G64 (the games name for the Commodore 64) and will end with the Xbox Next. You develop games by clicking anywhere on the screen to start a new project, this gives you a number of boxes to choose from which help you decide on what game you’d like to make (including the ability to name your title). Once you’ve decided on the game you’re going to make, your person starts getting to work on creating 4 different points that go towards to quality of the game: Bugs, Design, Technology and research. Generating these points to create the game takes approximately 2 months, in which time you’ll lose monthly costs (making your available cash drain all the time) and be given the choice on what parts of your game you wish to concentrate on. (e.g. do you want to invest more time into the development of the engine or the story? This choice differs for each game, and is completely up to you how you micro-manage employees time effectively.) Once you game is complete, publications review your game, and then it goes up for sale on the market, giving you the income needed to start work on your next game. It’s a neat little system that constantly keeps you entertained, ensuring that you don’t go a few seconds without having to manage a component of your company. You begin Game Dev Tycoon in your garage, toiling away for hours at new and exciting game ideas until you one day get enough money to move into a proper office. Game Dev Tycoon’s use of real world brands is fantastically comical, including the history of the products themselves. Due to copyright laws, Green Heart Games couldn’t use the exact names of consoles and companies, so chose to be creative with their terminology. Nintendo is Ninvento, Sony is Vonny, and Microsoft is Micronoft. It’s funny a funny look at the industry, and helps to put our industry in perspective as a strange and wonderful place. 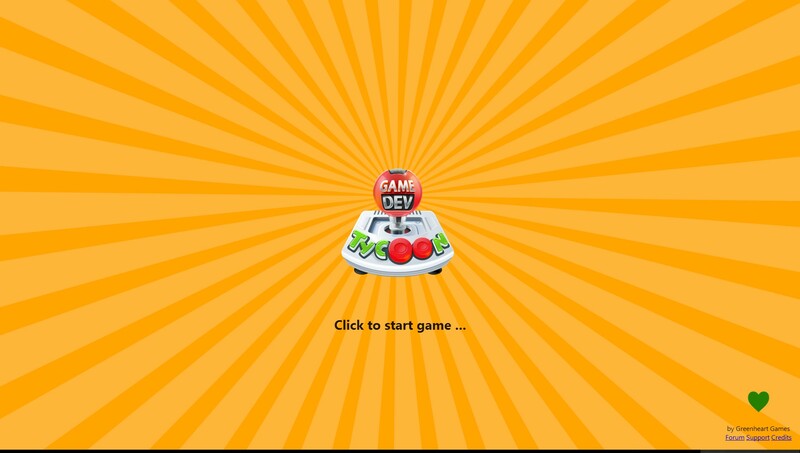 What also helps to fill Game Dev Tycoon with joy and glee is the offices you inhabit, each having little easter eggs or memorabilia that will certainly make any fan of the gaming industry squeal with joy. It all gives Game Dev Tycoon a certain charm that resonates throughout most of the game, a parody of real life, but a loving one. Game Dev Tycoon isn’t without its flaws, especially when it comes down to what games you should make. You’d think that making your own Game studio in a alternate universe would allow you to make whatever game you please, this is definitely not the case. Take for example if you wanted to make a turn based superhero game, you’d think that given enough resources and points in the right direction, this game would be successful with the market? Nope, Game Dev Tycoon ensures you stay within the confines of what happened in the real world in regards to games that were successful. The only way I was able to reach the end game was to have prior knowledge of the games that have been successful in the last few years, so a military action game aimed at the mature market (as close to Call of Duty as I could get) would sell a bucketload, but a school strategy game for everyone sells next to nothing. It’s a shame, as it requires prior knowledge of the games industry, and also stops players from experimenting with new types of games, which is never good for a game all about creating new things. 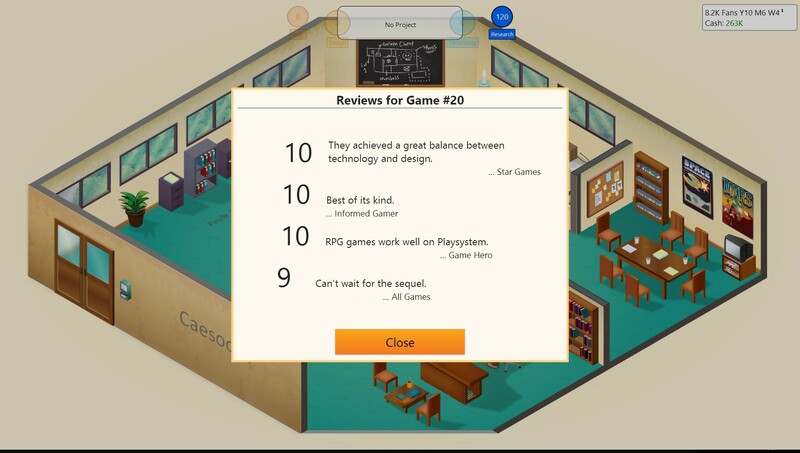 Overall, Game Dev Tycoon is a fantastic first foray into the games industry for developers Green Heart Games. It’s a game that’s generous on value, and certainly has a lot of replay-ability. If you’re the type of gamer who loves micro-managing strategy games, Game Dev Tycoons for you.